Firstly, this recipe is a little late but hopefully it will be worth the wait. It is my sister's birthday tomorrow so I baked her a cake for the celebrations yesterday. Her favourite cake is Victoria Sponge which can be really hard to recreate without traditional ingredients. So this was my attempt to make something inspired by an old favourite but with a healthy twist! I absolutely adore the raspberry coulis in this and keep coming up with other ways that I want to use it like in porridge or on toast! The coconut sugar brings out their wonderful flavour which complements the coconut perfectly to make a sweet, rich icing. 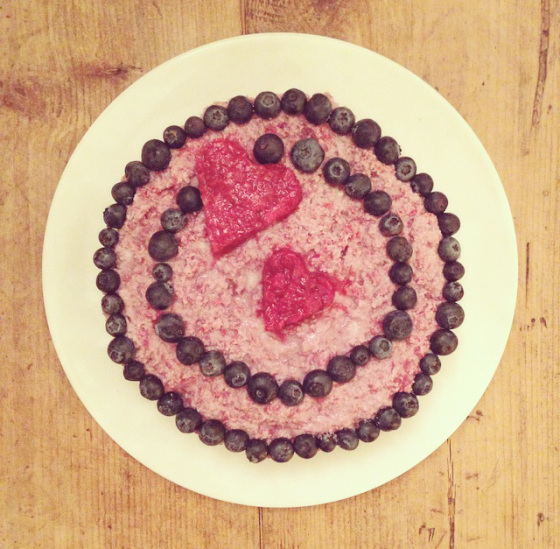 I decorated it with blueberries, another of my sister's favourites but you can choose cacao nibs, other berries, nuts or just leave it looking pretty and pink! Start by dissolving the coconut cream in 150ml of boiling water. You may want to break it up into smaller pieces in order to help is dissolve faster. Once it has formed a thick, smooth cream, place it in the fridge and let it set. If you are using whole almonds, place these in the food processor and blend until a flour forms. Pour into a mixing bowl and leave to one side. Pit the dates and place them in the food processor with the bananas until you have a gooey mix. Then add the other ingredients and blend so that everything is evenly mixed. If your food processor isn't large enough, you can do this part in a bowl. Grease two cake tins with coconut oil then divide the mixture between the two, smoothing with a spatula so that the tops of the cake are flat and neat. Place these in the oven for about 20 minutes or until you can poke a knife in without any batter sticking to it when you pull it out! Next is the raspberry coulis... While the cakes cook, gently heat the frozen raspberries in a pan with the coconut sugar. Stir constantly with a wooden spoon until the raspberries have broken down into tiny pieces. 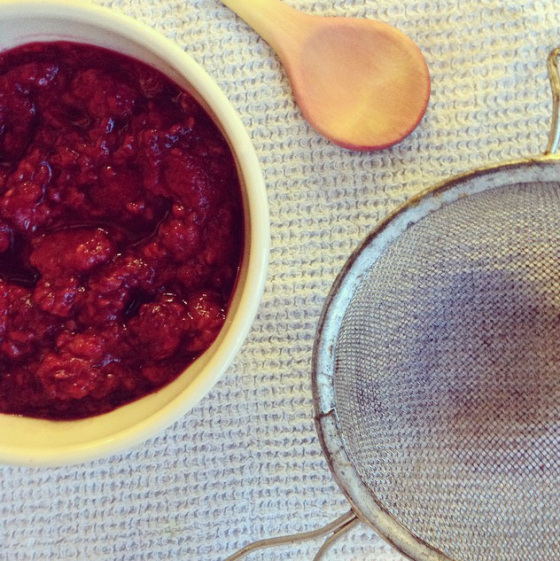 Remove from the heat and pour the raspberries through a sieve to remove excess water then place to one side to cool. When the cakes have cooked through, place them on a cooling rack to cool. This will also allow them to set so it is really important to let them cool properly before icing. Remove the coconut cream from the fridge - it should have become fairly solid but if not you can always pop it in the freezer until it hardens slightly. Take 1/3 of the coconut cream and place it in the food processor with the almond butter and about 1/3 of the raspberry coulis and blend until smooth. Be careful not to mix for too long as you don't want this to heat up. Spread this on one half of the cake. Slice the vanilla pod lengthways and scoop out the seeds. Add this to the remaining coconut cream and raspberry coulis and blend into a pretty pink icing, then spread onto the second cake. (I left a little bit of the raspberry to one side to decorate with). Decorate the top with berries, extra coulis or just leave it as it is. Then place this cake on top of the other and leave in the fridge to set. This cake is best stored in the fridge and will last about 3-4 days.